​Meet Hanif: Despite both of Hanif’s parents, Khuraira and Patrice, being carriers of the Sickle Cell trait, they were confident that he would not be born with Sickle Cell Disease. Already having had 2 children without the disease, Hanif’s parents felt that he would be no exception. Hanif’s vibrancy as a newborn made Khuraira all the more certain. However, results from testing after his birth proved otherwise. Having lost friends and family from Sickle Cell Disease, Khuraira and Patrice were devastated by the news. However, they pledged to be optimistic for their son’s future. Having come to the United States from Nigeria, they knew the quality of care would be better for their son than their friends and family had experienced. Despite this, Hanif and his parents would be severely tested by the disease. Meet Kyle: Kyle wants to be a doctor when he grows up. This dream was sparked by his battle with Sickle Cell Disease (SCD). Like so many with SCD, Kyle’s life of pain began at birth. He remembers being scared as a child when he would go into crisis— not knowing when it might happen or how severe it might be was frightening to think about. Terrible pain, severe heads and asthma attacks would strike without notice. He would have to spend days at a time in the hospital missing school and playing with his friends. At the age of 10, Kyle had the opportunity to end his battle with SCD when a new trial would allow the use of his mother’s cells for a transplant. Prior to this trial, transplant was not an option as Kyle did not have a related match. When the option arose, Kyle says he gained strength from his mother and knowing that she would be by his side. Like his mom, he thought about the good that would come from the transplant— a life without pain. Since the transplant, Kyle has not experienced a crisis or any pain associated with SCD. He no longer misses days of school or his friends because of SCD. When he is older, he would like to be “Dr. Howell” so that he can help children suffering from SCD and sickness. Kyle shared with us: “I hate seeing people in pain and want to help.” He hopes that this trial will help other children living with SCD just as it did for him. Althea's Story: Today, you can speak with Althea Salmon and have almost no hint of what this strong-willed fourteen-year old has spent her life battling. Born in 1999, Althea was diagnosed during newborn screening with Sickle Cell Disease, a hereditary blood disorder effecting hemoglobin that can impact nearly every organ in the body. It brings on a host of severe health issues including the potential for acute life threatening complications of the lungs, brain, and immune system, as well as severe anemia. Patients also suffer from recurrent and severe episodes of pain that are debilitating and require strong doses of pain medications. Already having a son diagnosed with the disease, Althea’s mother, Joan, knew that it would likely mean a life in and out of hospitals for her daughter. For Althea, this would be the least of it. One morning, while helping her daughter dress for school, Joan noticed that Althea was only using one hand. It had turned out that at the tender age of only four years, Althea had suffered her first stroke, impairing her hand. Joan recalls that nothing ever kept Althea down, even at such a young age, she was a strong girl with determination. Nevertheless, suffering from strokes brought on further complications within Althea’s brain known as the Moyamoya syndrome. In 2006 and again in 2009, Althea would need brain surgery in an effort to alleviate some of the chronic changes brought on by Moyamoya. At this point, because Althea was a high risk candidate for continued strokes and permanent neurological damage, it was imperative to consider other avenues of support and treatment. 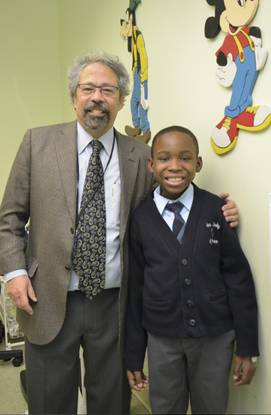 Althea’s mom came to find out about Dr. Cairo and a novel treatment strategy he is pursuing for Sickle Cell Disease in pediatric patients. While stem cell transplants are the only curative option for Sickle Cell Disease, most of the success in curing the disease has been limited to matched sibling stem cell transplants. Statistically, most patients with Sickle Cell Disease do not have a matched sibling donor, therefore the need to develop effective alternative options for performing a curative stem cell transplant in these patients has been dire, especially for patients like Althea. 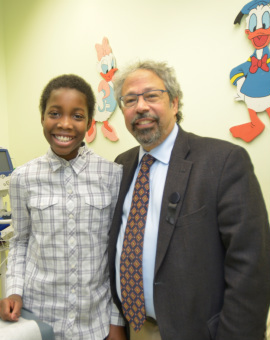 By using the stem cells of a parent, or a related haplo-identical blood stem cell donor, Dr. Cairo has been able to provide the hope for a cure for the vast majority of patients suffering from Sickle Cell Disease. After meeting with Dr. Cairo and weighing their options, Joan and Althea decided to move forward with the transplant. While Althea admits that perhaps she was a little nervous and thought it might be scary, her reaction was “Let’s do it!” For Joan, there was no other real option for her daughter. Althea would undergo both chemotherapy and radiation prior to the transplant. Besides losing her hair, dealing with mucositis and nausea, Joan saw her daughter pushing and fighting for strength and a chance for a normal life. Joan recalls telling Althea over the years: “never let sickness get the better of you.” And certainly, Althea has not. Althea is now over 1.5 years out from her transplant from her mother and is cured of her sickle cell disease. She has no more symptoms related to sickle cell disease and is happy to be back in school.